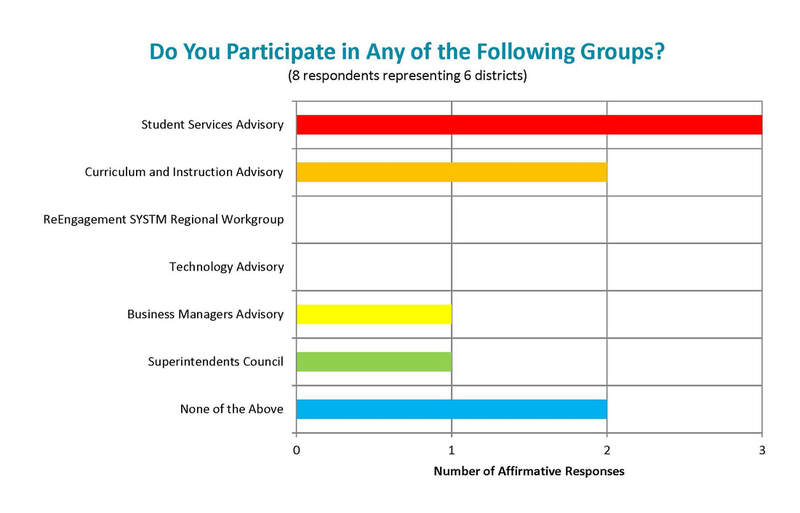 Respondents were surveyed about their participation in Advisory Groups. 8 respondents representing 6 districts indicated their participation. Respondents were surveyed about their opinions about advisory groups. • Participation in advisory groups is a good use of my time. • Participation in advisory groups has an impact on regional student outcomes. • Participation in advisory groups keeps me networked with my colleagues. • Participation in advisory groups keeps me informed about MESD services. • Participation in advisory groups gives me an opportunity to influence the Local Service Plan offerings. • Participation in advisory groups gives me an opportunity to influence the quality of the services. • Participation in advisory groups gives me an opportunity to influence the cost of the services. • Participation in advisory groups gives me an opportunity to influence the responsiveness of the services. 7 respondents representing 5 districts offered their opinions. • 7 respondents indicated that participation was a good use of their time. • 6 respondents indicated that participation had an impact on regional student outcomes. • 7 respondents indicated that participation kept them networked with their colleagues. • 7 respondents indicated that participation kept them informed about MESD services. • 7 respondents indicated that participation gave them an opportunity to influence the Local Service Plan offerings. • 6 respondents indicated that participation gave them an opportunity to influence the quality of the services. • 4 respondents indicated that participation gave them an opportunity to influence the cost of the services. • 7 respondents indicated that participation gave them an opportunity to influence the responsiveness of the services. 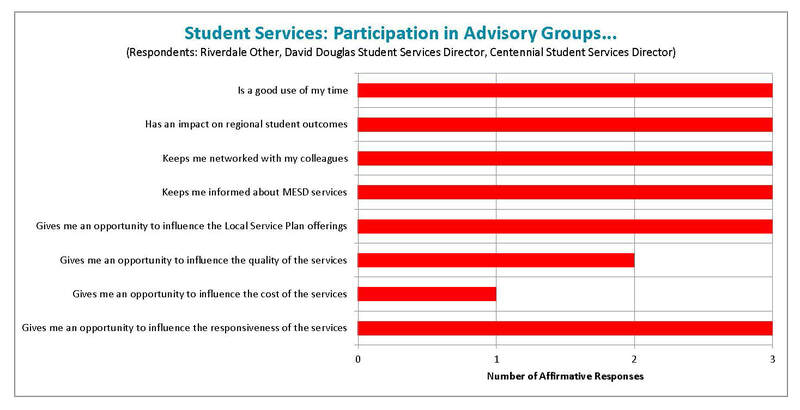 Respondents who participated in Student Services Advisory were surveyed about their opinions about advisory groups. 3 respondents representing 3 districts offered their opinions. • 3 respondents indicated that participation was a good use of their time. • 3 respondents indicated that participation had an impact on regional student outcomes. • 3 respondents indicated that participation kept them networked with their colleagues. • 3 respondents indicated that participation kept them informed about MESD services. • 3 respondents indicated that participation gave them an opportunity to influence the Local Service Plan offerings. • 2 respondents indicated that participation gave them an opportunity to influence the quality of the services. • 1 respondents indicated that participation gave them an opportunity to influence the cost of the services. • 3 respondents indicated that participation gave them an opportunity to influence the responsiveness of the services. 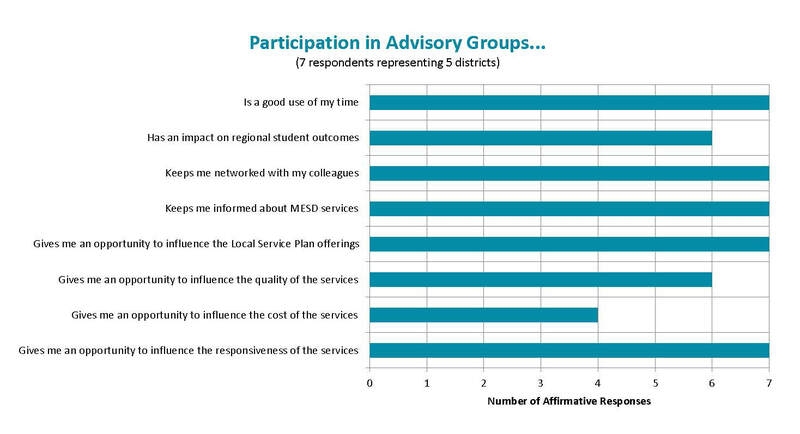 Respondents who participated in Curriculum & Instruction Advisory were surveyed about their opinions about advisory groups. 2 respondents representing 2 districts offered their opinions. • 2 respondents indicated that participation was a good use of their time. • 1 respondents indicated that participation had an impact on regional student outcomes. • 2 respondents indicated that participation kept them networked with their colleagues. • 2 respondents indicated that participation kept them informed about MESD services. • 2 respondents indicated that participation gave them an opportunity to influence the Local Service Plan offerings. • 2 respondents indicated that participation gave them an opportunity to influence the responsiveness of the services.